A quick and easy Thai-style spicy chicken-in-rice seasoning mix, and this is DELICIOUS! 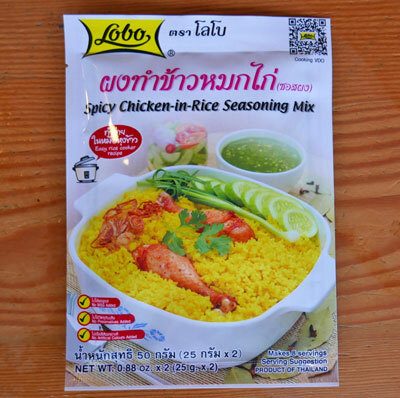 The flavor is more southern Thai, hint of Indian influence. In each envelope you get two individual packets. Rub contents of one package on 1 lb chicken. Marinate 15 minutes. Put chicken parts together with uncooked jasmine rice in a rice cooker. Simply turn on the rice cooker and it cooks together for 20 minutes. The result is fragrant, delicious yellow rice and moist chicken. Serve with hot cucumber. Ingredients: dextrose, salt, hydrolyzed corn protein, spices, silicon dioxide as anti-caking agent. No artificial color, no preservatives. Product of Thailand.